It’s Tuesday morning, 6:30 am. My body clock woke me up on the dot, at the same time I have gotten up for the last 3 days. Why would I have gotten up early every day of the Easter weekend? I have to say that by Sunday I was asking myself the same question. Nigel, Stuart and I entered the Surrey League 3 day for 3rds. Its definitely one of the hardest things I have put myself through, I think the others would agree. It would have been made so much harder without Stuart kindly giving us lifts out to the courses every day. It was also fantastic to have support every day. 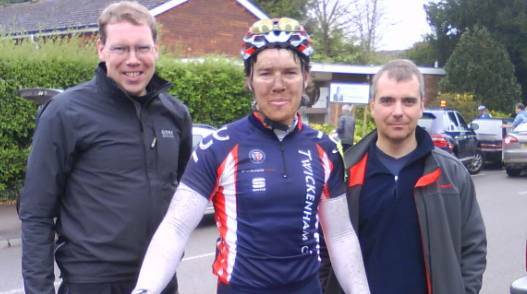 It makes such a difference to see a friendly face when you are exhausted, covered in mud from head to toe, and still have 40 miles to go. Not to mention the actual help offered. On Sunday, by Dave, who passed me fresh water at the top of one of the climbs, and by the whole team effort to get me an energy gel on Monday. Unfortunately I didn’t close my hand fast enough and the gel bounced out. But it was my own stupid fault for forgetting food. I wanted to say a huge thanks to everyone who came out, especially Dave who made it every day, and Mark who was there for 2 of the 3 days. We met up on Saturday morning with some trepidation and loaded up Stuart’s car to the roof with bikes and wheels. A steady drizzle and mist settled in for the day and promised to make racing that little bit nastier! Getting out to the course at Milland Hill a bit early we made the mistake of driving round the route. Already nervous, I was genuinely scared once I had seen the route. There was a lot of climbing, including a 25% section. That would have been fine, but we then found out we would be doing 9 laps! (60 miles). Of course that meant 9 times up this hill. Ouch. All 60 of us set off from the HQ at 9:30 for a short neutralised section. One poor chap punctured in front of me as we rode out of the car park. The start of the course drops down, then rolls up and down, then swings round to the bottom of the climb. The pace was fine but hitting the climb for the first time I realised how hard it was going to be. Nigel looked to be happy though and was quickly up front while I held on grimly at the back. Stuart was back there with me and suffering as well. Off the top of the steep section of the climb there was another long uphill drag to get back to where we started, and the HQ was. The finish line was at the top of the steep section of hill. After about 4 or so laps I saw Nigel slipping back to join me on this long drag. He looked to be in some trouble. Up ahead I saw the field start to string out. Someone was putting the hammer down, I yelled watch out to Nigel as I went past (though he later told me he hadn’t understood). It was about all the breath I could spare. Someone hit it hard on the front and the whole bunch strung out. Gaps were opening in front of me. A Brighton Mitre guy left a huge one, as did a little guy from Kingston Wheelers. Worried I would end up dropped and had start jumping gaps and moving up. I seemed to collect a few people behind me and eventually we made it panting up to the front where I felt safer. I had hoped that Nigel had gotten on my wheel but when I finally had time to look round he was gone. As had Stuart. There was no time to worry as the pace stayed high for a while longer but eventually slowed again. Suddenly Nigel re-appeared after making a herculean effort to get back on. I understand he also collected various other strays on his way back. Including a London dynamos rider called Robin. For some reason I ended up spending a lot of time riding along side him in the last 3 days and I can say that he was a jolly fine fellow and London dynamos are clearly not all bad! The pace yo-yoed about but by 2 or 3 laps to go I realised that I was going to make it. The bunch (or what was left of it) caught the breakaway and we did a lap together before people started trying to jump off again. I had move up front by this stage. There were big teams of riders for Dynamos, Norwood, Velocity, and a few others. A break got away on the last lap and had people from all these teams in it. I was up front and no one was making any effort to get them. I was keen for the bunch sprint so started trying to chase them down but no one helped at first. They were all saying they had someone in the break. Eventually 2 or 3 others started to help me and though we didn’t manage to catch the break before the hill we managed to keep them in sight. I was up front as we hit the hill and a few people came past me as I dragged myself over it for the last time. I came in 26th. 49 seconds off the leaders but in a group of other riders. Nigel came in further back and they pulled Stuart out because he was going to be in the way of the finish. I was really pleased to have survived and thought the worst had to be over. On day 2 we headed out to the Cutmill course. Again we drove round and it looked even worse, very rolling, and very hilly. We set off in the mud and rain. The start of the race was neutralised again, but not very effectively and we seemed to be racing before we were even on the course. It was quickly apparent that there were people who wanted a really hard and fast race. The pace went up and stayed up. On the back side of the course there was rolling climb then a long rolling descent. On the other side there was a long hard climb and a scary descent through a village. They thoughtfully put the finish on the top of the hill. 9 laps. Oh good. Riding up the long hill with Nigel he pulled his chain off and started cursing. At the top of the hill he was gone. As seemed to be his luck the Dynamos team decided to take the opportunity on the long rolling descent to put the boot in. This was about lap 3 or 4 I think. They kept it up for another 2 or 3 laps (my brain is already blanking it out). The only thing I remember thinking is, if they keep doing this much longer I will be shelled out the back. At some point there was a breakaway. I didn’t notice, I didn’t care, I was more worried about surviving! When the pace finally slowed there seemed to be a lot less people left in the bunch. I think about half the field had vanished. We did a few more laps with no one making any effort to chase the bunch. I remember one lady shouting that the break a 1:15 on us, go and get them. A rider near me muttered something about ‘going bike racing to get away from the nagging’, which drew a few weary laughs out of the bunch. Coming round the last laps I realised that instead of slipping back on the hills I was gaining places and spent some time up near the front seeing what was going on. I was right up front coming into the final climb, staying at 3rd or 4th wheel. A DHC rider went early - very early. It looked rather like one of my own previous manoeuvres, and predictably we got him with about 200m to go as we passed the yellow flag. A rider went to my right, so I got on his wheel. I noticed a velocity rider who I had chatted with earlier come past me on my right. I got up to sprint. Sprinting uphill at the end of that course had me seeing stars. I got back round the velocity rider, but other, ‘more lightweight’ members of the bunch were coming through. I remember seeing Mac and Dave at some point, then crossing the line needing to not be on my bike any more. I stumbled off it, and sat down in a nice little muddy ditch by the road. At the time it was heaven. A bystander kindly stood my bike up for me and asked if I was ok. I said yes ‘fine thanks’. I am not sure she was convinced. I thought I had gotten a placing but there were more in the break than I thought and I found out I had come in 11th. As I started to feel human again I went back down the road to find Mac and Dave and we rode back to the HQ. I was covered in mud, from head to toe. The organisers packing up the finish said that ‘by the state of my face I had spent all day at the back hugging people’s wheels’. Well yes I had, and I am not ashamed of it, it was the only way I survived! Last day we raced the Alfold course. Getting out there we didn’t bother with a recce - just a quick warm up, and into the race. The course was much more rolling. My GPS said we actually did quite a lot of climbing but the pace was higher and you carried speed from roll to roll so it didn’t feel so bad. Early on a Velocity rider jumped of for a solo break. A smug team mate of his said to me ‘watch him go, he will be out there all day’. Other breaks tried and failed to get away. Then one got away, 3 riders I think. There was a lot of reluctance to chase, I think everyone was tired (me too!). A big Kingston wheelers rider did a lot of work on the front. About half way through I realised I had forgotten to put my food in my pockets. Not smart. Nigel kindly gave me his banana. The bunch eventually caught the break and then the velocity rider who had gone solo early on. His team-mates looked a little less smug when that happened! It was an amazing effort though. With 2 laps to go another breakaway went. I decided to get involved in it. I jumped across (helped by a large crowd of TCC supporters who happened to be there when I decided to go!!). I spent quite a while (or it felt like quite a while!!) getting them. But when I got there they started to slow and the bunch came and got us. Nigel was up near the front as the bunch came through so I got near him. Another breakaway went and he said he would get this one! There was an evil gleam in his eye and he set about repaying the bunch for the two days of pain they had put on him. He must have done 7 or 8 km on the front, me tight on his wheel. On one of the rises I had time to look back and saw the whole field strung out single file behind us. What a feeling! Fantastic! I told Nigel to keep going he was doing damage. With a bit of a roar he got up out of the saddle and went again, I clung to his wheel (just). We hit a village with a tight right then left turn and I almost didn’t make it round we were going too quick. Then we headed down another descent that ended in a right-hander. Nigel found even more speed and we flew down. He hit the corner a little fast I would say!!!! Swinging out way, way wide and last I saw of him he was swearing and skidding about on the loose stuff at the side of the road. He had done the job though. The breakaway was only 30 meters down the road and I pulled the field through the last little bit. So coming into the last lap it was altogether. Nigel reappeared without any bruises so he must have gotten round the bend and we settled into the bunch. Or rather, I did. Nigel clearly found his calling and got back up front. For the last lap he worked hard on the front, keeping the pace high, and generally making no friends. A dynamos guy I know vaguely and who knows Nigel well was cursing his name to me. And the big Kingston Wheelers rider who had done so much work asked what he was on. I got up front as we headed towards the finish as a bunch. Nigel had dropped back and the pace kept slowing and I kept getting swamped. It was dangerous as everyone tried to pile through whenever the pace slowed. Coming into the finishing straight I was up front but not in a great place. A Landover appeared and all the people on the wrong side of the road caused a crash trying to avoid it. Luckily it was behind me, just keep going. I was looking for a gap, and just seeing bodies. No way out. We passed the 200m flag and I still hadn’t gotten out. I could see others had gone. So frustrating. Eventually I found/made a hole and got out. 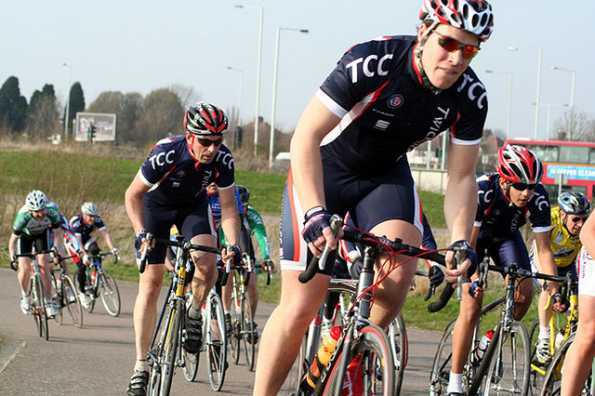 I passed a load of riders, heard the TCC support and went again. I stole another place off an In gear development kid on the line which was particularly sweet. I have developed a special dislike for this lot over the last 3 days. They had 4 kids in the race and they were the only people I saw tossing gel packets on the road. I really feel that the team should be teaching their kids how to behave, or they will grow up doing it and never stop. During the race one of them threw a packet when he was right next to me and the big Kingston wheelers rider. We both told him he shouldn’t do it and he told us that we should go and pick it up ourselves. I managed to pull off a 7th from the sprint, but was a little frustrated. Still we all avoided the crash and finished safe. It was so so hard but I enjoyed it immensely. In the end I was 19th in the GC. Nigel and Stuart got punished with 30 minute penalties for being pulled up which seemed a little harsh to me. The gaps up the top were pretty small. Time bonuses make a huge difference. There was only 50 seconds between me and 3rd place. I hadn’t realised how much difference small gains can make! I hope I learned some lessons and got fitter for the next races!